Evensville, TN — The Rhea County Eagles baseball team won 3-0 against Warren County in the home opener to even district record at 1-1. This was a fantastic pitching duel by both Guthrie and Tyler Hollinsworth but in the bottom of the sixth inning the Eagles put up three runs and that was all Guthrie would need for the win. Guthrie was overpowering with seven strikeouts(five in last two innings) and he finished strong by striking out the side in the top of the seventh inning. The three run sixth inning began when Reece Cooley hit solid double. Keaton Ray put down excellent sacrifice bunt and Warren’s third baseman sailed his throw high, allowing Cooley to come home. Dusty Smith sent Ray home with second run of game and scored the third run on a passed ball. Reece Cooley and Dusty Smith each finished with doubles on the night and Matt Levi and Hunter Hale each had singles for the four Eagle hits. 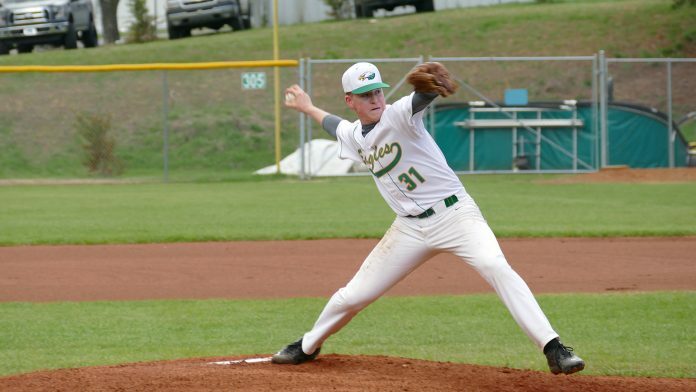 On Thursday night Ross Pendergrass pitched a good game but Rhea County could only scratch across one run in the 4-1 loss to Knox Webb. Eagles had hits by Matt Levi, Dusty Smith, Lucas Travis, Keaton Ray and Baylor Dulaney. Ross pitched into the sixth and then Hunter Hale finished in relief.